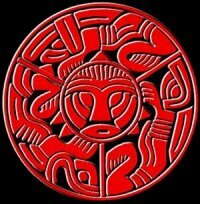 Celtic Art, just like Runes is a subject that is often misunderstood and even more often mislabelled. Of all the artwork on this page only one pattern dates from the Iron Age, the time of the true Celts. Unfortunately I have seen books full of the others, all described by authors who should know better as “Celtic” art. Let us start from the beginning. 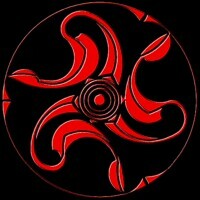 Iron Age Celtic art like the design below the Lore and Saga logo was based on flowing lines, curves and spirals. Britons developed their own unique styles and this is typical art from before the Roman invasion of Britainnia. Under Roman influences some strains of this idea survive but in a tidier more symmetrical fashion as can be seen in the circular design on the left. The animal / zoomorphic designs are also set to influence and be influenced by the native British art. By the seventh century the people of these isles are more easily described as Anglo-Saxons living in Angleland. The old Romano-British mainly live in the far West and North and are labelled as foreigners or Welas by the Saxons. This is the root of the word Welsh in case you were wondering. The Anglo-Saxon art shown to the left of the page shows many influences. the animals are more stylised and exaggerated. The Knotwork motif has developed but notice also the spirals taken directly from the last examples of true Celtic art. Little did the Saxons know it but they were about to gain new influences from the Vikings. The Vikings, like the earlier Saxons favoured animal designs but with a wilder, less formal sweep to the lines. When Saxon and Viking art met the result was a striking combination of the best of both worlds. This continuous development has led many to suppose that it is all “Celtic” but without the impact of the other Germanic cultures the native art of Britain would have been very different indeed.